These were very tumultuous years for the company. 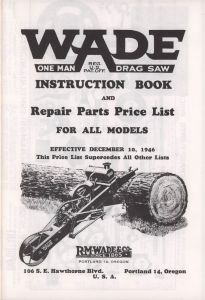 The Wade Drag saw became the world leader in automatic cross cut saws. In 1923 the company purchased Multnomah Iron Works to make the saws which were previously made for it by a company in Wisconsin. 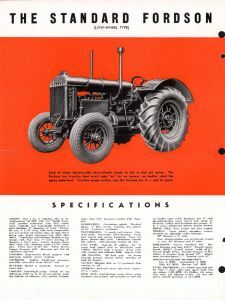 The acceptance of the farm tractor to replace horses accelerated with the 1917 introduction of the Fordson Tractor, known as the Model T of tractors. There was an agriculture depression in the 1920’s which caused the company to liquidate inventory below cost. Then just as the 1929 economic collapse occurred Edward J. Newbegin passed away and his son Wade Newbegin became president. He was able to turn the company around. 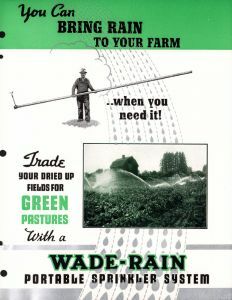 It was profitable during the 1930’s and in 1936 the company introduced Wade Rain sprinkler irrigation. Around 1915 R.M. 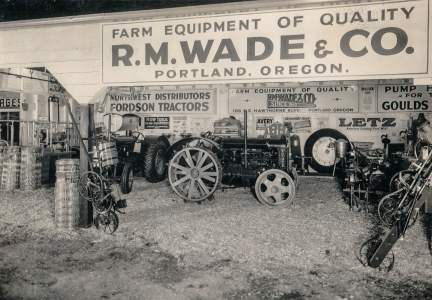 Wade & Co. began selling the Heider Tractor. 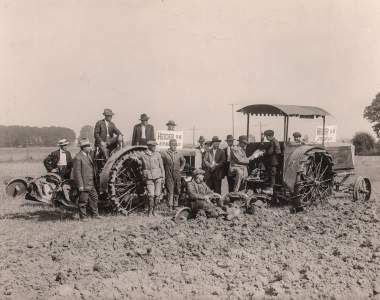 The Heider Tractor was invented by Henry Heider in 1910-11 and in 1915 he introduced the famous Model C. It was such a success that the company could not finance the rapid growth and it entered into a partnership with the Rock Island Plow Company, a large manufacturer of farm equipment located in Waterloo, Iowa. The Model C was very innovative. It had seven forward and seven reverse speeds or powers, whereas previous tractors had had only one. 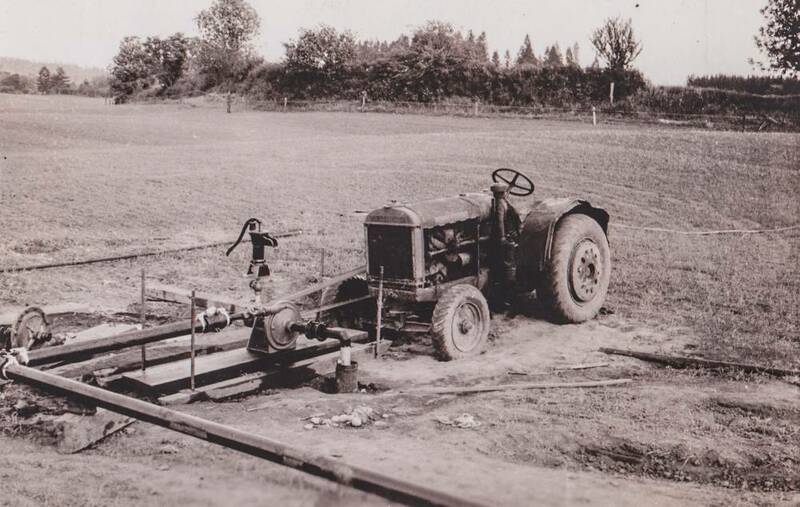 The wide range of speeds was a big advantage as the farmer could select the appropriate power range to do the job. The Heider tractor was extremely popular from 1915 to 1929 and it ushered in the era of gasoline powered farm tractors as the period of horse drawn implements drew to a close. 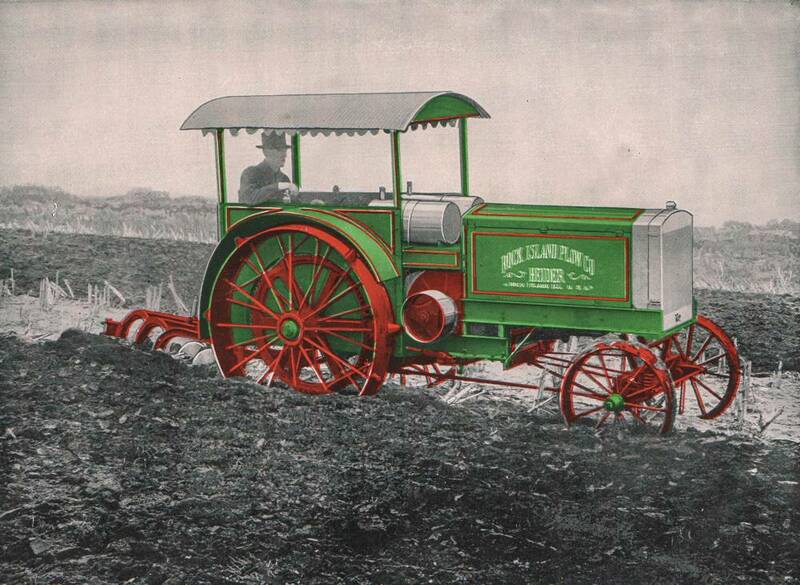 The video below shows a functioning 1917 Heider Model C tractor. R.M. 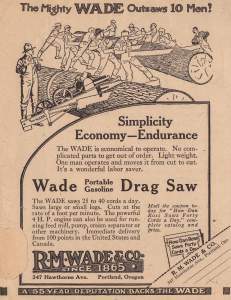 Wade & Co. introduced and patented the gasoline driven one-man drag saw for loggers. It had a wheel on one end making it possible for one man to operate it by himself. It was an innovation in a class by itself. It was originally made by a factory located in Oskosh, Wisconsin. 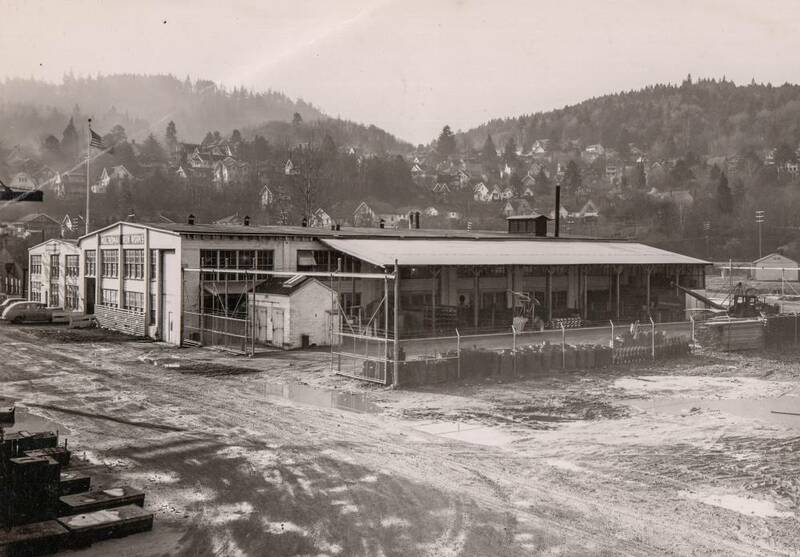 Later production was moved to the Multnomah Iron Works Company in Portland. 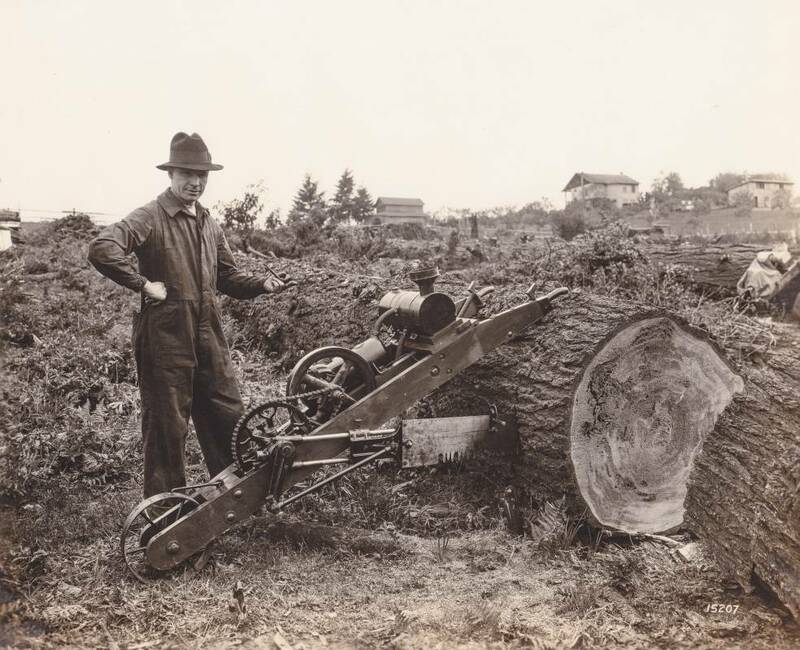 The drag saw was marketed internationally and was sold in Australia, England and Germany. It was a world famous product, and in fact the most popular drag saw sold throughout the world. 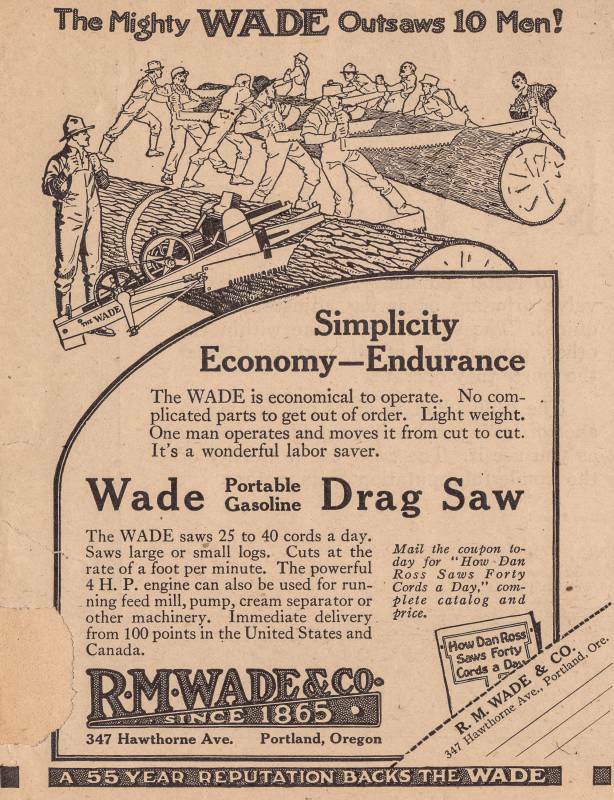 The very last drag saw made by R. M. Wade & Co. is on display at the Oregon Historical Society. 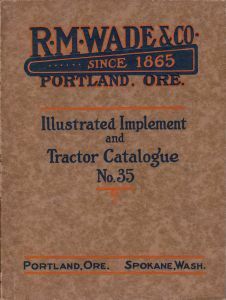 Illustrated implement and vehicle catalogue N. 35, Portland, Oregon & Spokane, Washington. 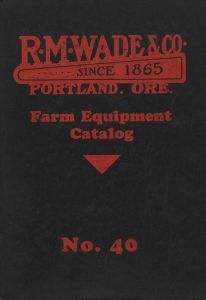 This is a complete 1920 catalog and can be viewed opening the pdf and scrolling down through the pages. Following World War I there was a depression in the agriculture sector of the economy. There was a drop of over 50% in the market for farm equipment. Because of this market decline and because of bad debts the company was in financial difficulty. It struggled through the 20's to clean up its inventory and took over a 50% write down on many items. The inventory overstock was not cleared for another eight years until the 1930’s at which time the Great Depression started. These were difficult years for the company and by 1932 the company was re-organized and ownership transitioned to the Newbegin family. The Fordson tractor was first introduced in 1917 by Henry Ford. 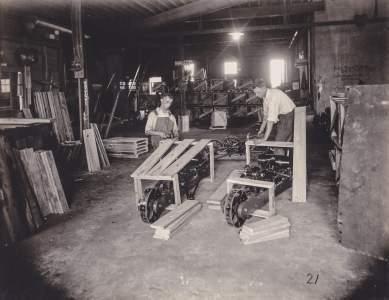 He wanted to build a tractor that would do for agriculture what the Model T had done for cars. He wanted to make a reliable vehicle at a very low price and he succeeded with the Fordson Model F. This tractor was the key to convincing the American farmer that a tractor was much better than a horse. The Model F cost only $750 and Ford proved it could plow for 96 cents an acre as compared to the cost of draft horses which was estimated to be $1.46 per acre. In 1922 production of the Fordson tractor was moved to Ford Motor in England and thereafter it was imported into the United States. R.M. 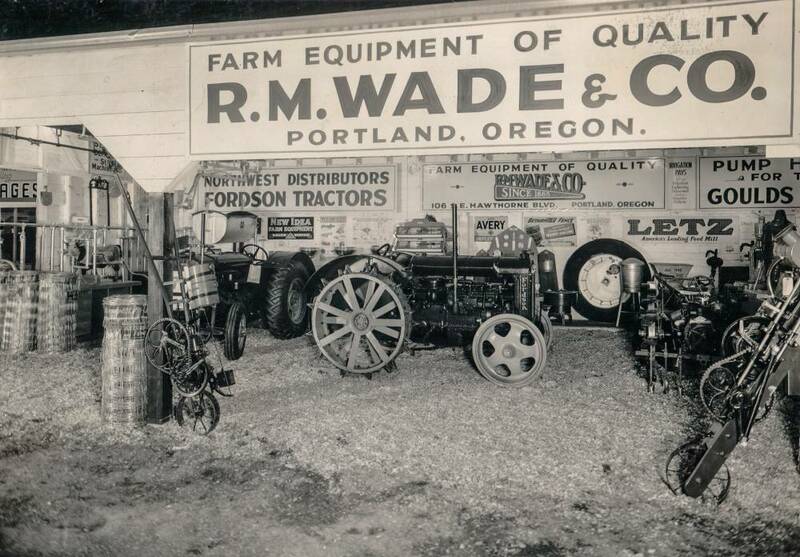 Wade & Co. first started distributing the Fordson tractor in 1931 when Ford decided to change distributors in the Northwest. 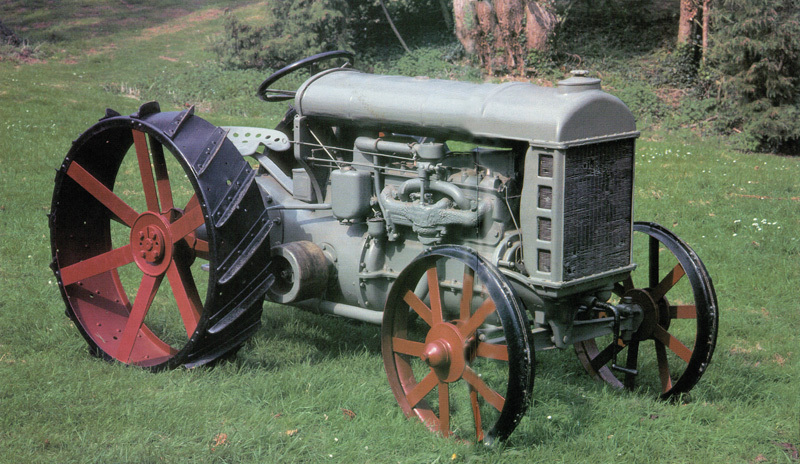 The company successfully sold the Fordson until 1939 when the radical new design of the Ford-Fergusen tractor completely revolutionized the market. In 1927 R.M. 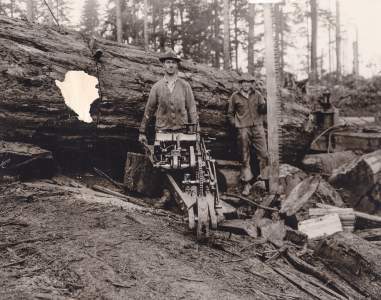 Wade & Co. purchased Multnomah Iron Works, the manufacturer of the Wade Drag Saw. 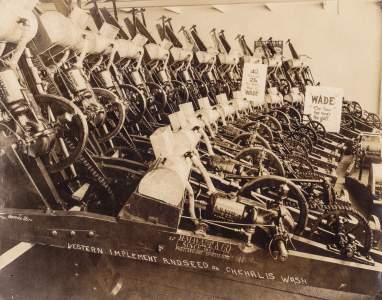 This became the manufacturing division of the company and later was renamed Wade Manufacturing Company. Wade Manufacturing made Wade Rain irrigation products. It was located on N.W. 29th Street in the Guilds Lake Industrial area of Portland. Edward Newbegin passed away suddenly in August of 1929. 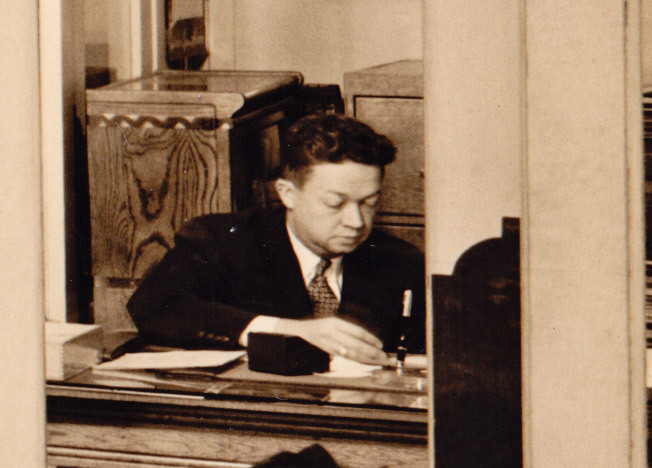 His son, Wade Newbegin, was appointed president of the company at the age of 21. The stock market crash of October 29, 1929 signaled the beginning of the Great Depression. The company had to liquidate its inventory and turn everything it could into cash. All departments were downsized and the company ran on a cash basis. 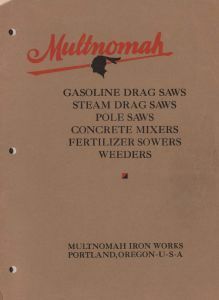 In the meantime Multnomah Iron Works (later to be renamed Wade Manufacturing) was doing well with drag saw sales. Once Wade Newbegin became president he discovered that the company had excess obsolete inventory which needed to be sold. Unfortunately there were no buyers and he had to sell the inventory for a very low price to maintain cash. The shareholders were not happy with the situation and filed a lawsuit to liquidate the company. The problem was resolved by buying out the other shareholders and the ownership transitioned to the Newbegin family. 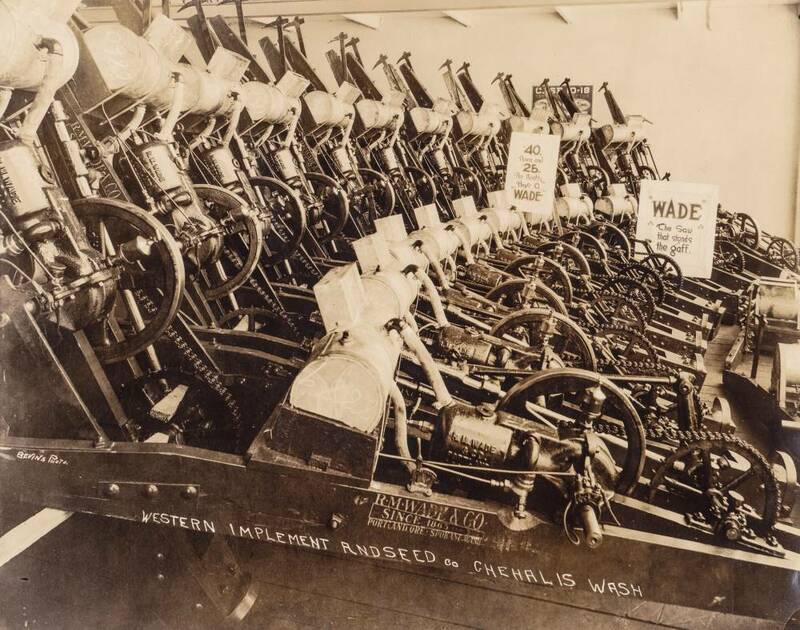 In 1932 R.M Wade & Co. started selling Goulds Pumps, which were made in Seneca Falls, New York. 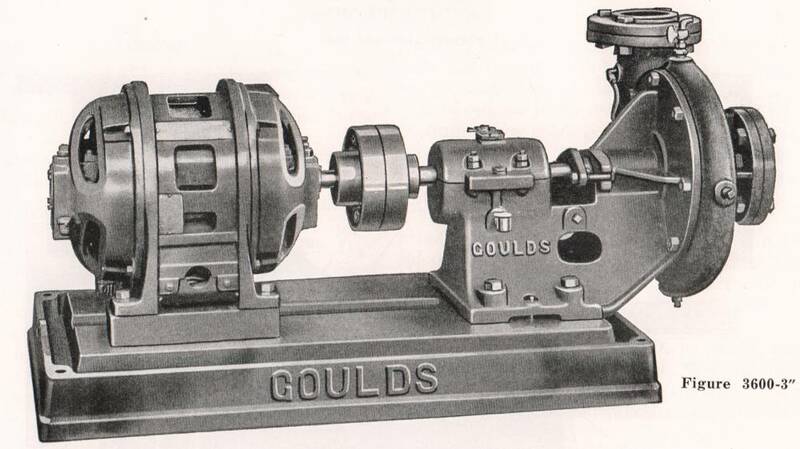 Goulds had been in the pump business for many years and R.M. Wade was especially interested in their line of water systems pumps for small wells. 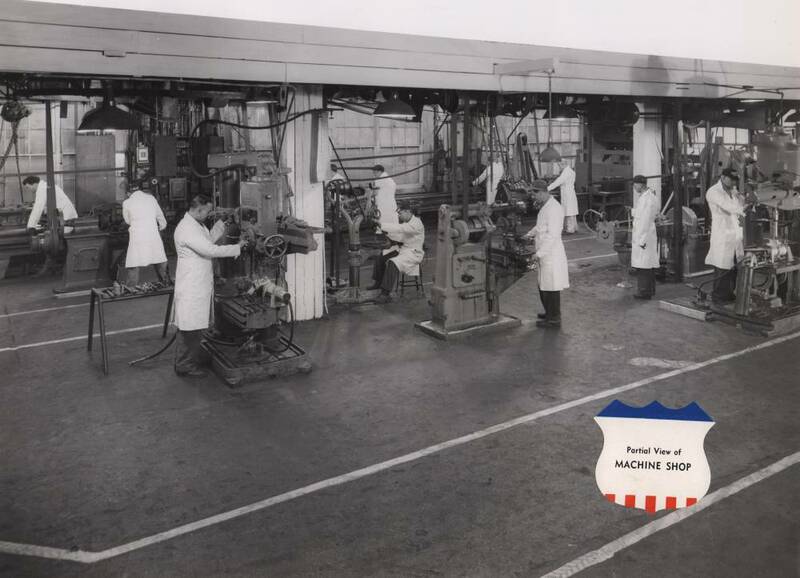 Goulds Pumps sold successfully and became a major component of the company's sales volume. R.M. 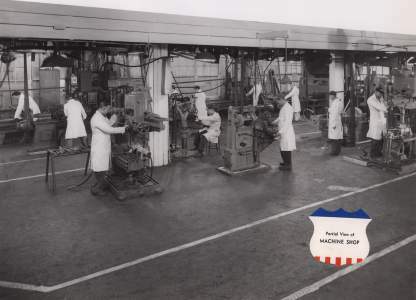 Wade was the exclusive representative in the Northwest for Goulds and had a long and profitable relationship with them. Once the company ownership was consolidated it became profitable and never lost money again through the entire depression, even in 1932 the worst year. The Emergency Banking Act (the official title of which was the Emergency Banking Relief Act) was an act passed in 1933 in an attempt to stabilize the banking system. Beginning on February 14, Michigan, which had been hit particularly hard by the Great Depression, declared an eight day bank holiday. Fears of other bank closures spread from state to state as people rushed to withdraw their money just in case. Within weeks 36 other states held their own bank holidays in an attempt to stem the bank runs. The banking system seemed to be on the verge of collapse. There wasn't a single bank open in Oregon during the holiday and when the banks reopened the federal reserve system provided funds for bank liquidity. 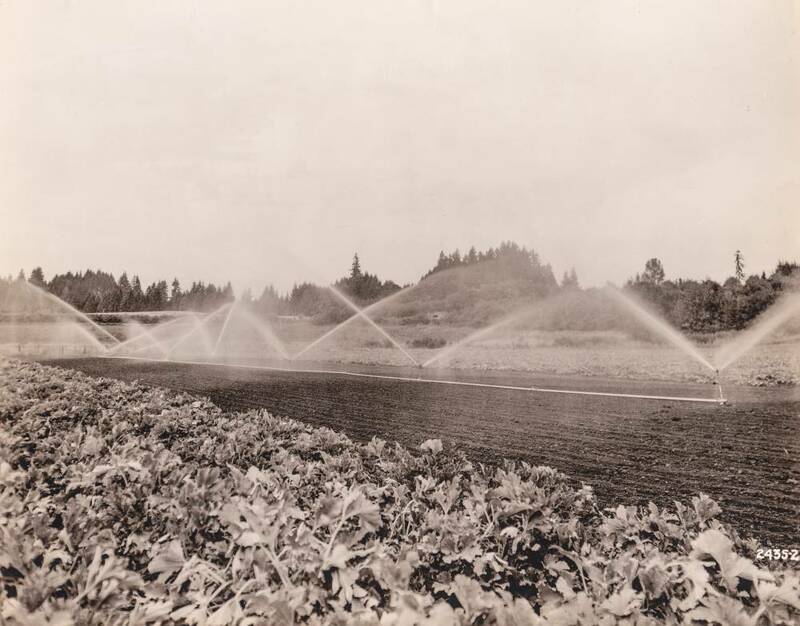 In the summer of 1935 Wade Newbegin visited Oregon Agricultural College (Oregon State University today) and saw a demonstration of a sprinkler irrigation system . He decided that this would be a natural product for Multnomah Iron Works (later renamed Wade Manufacturing) to produce. The following year Wade Rain Sprinkler Systems were introduced. At the time there were three other manufacturers of sprinkler irrigation R.H. Pierce of Eugene, California Culvert Company, and Shur Rain of San Jose, California.Wade Mfg Co.
Wade installed its first irrigation system in 1936. The installers had to work late into the night, all the while coping with a big bull in the next field, who attempted to attack them several times. It was a challenge to sell irrigation in Western Oregon – the webfoot state!!! The company had to work on selling the concept of irrigation to the farmers. One of the sales examples used was that the production of green beans could change from the then typical two tons per acre to an amazing ten to fifteen tons per acre yield by using irrigation. Sales personnel demonstrated the use of irrigation systems with a trailer that had a pump on it and a 5-10 foot length of pipe with couplers and sprinklers on it. The company worked closely with Dean Price from the Oregon Agriculture College and other faculty to spread the word about the advantages of irrigation use to grow crops in the Northwest. Local power companies reduced the cost for pumping irrigation water. In addition there were field agents for agriculture who would design and laid out irrigation systems for farmers and advised them on their crops. At about the same time Wade Rain introduced the sprinkler irrigation system made by the Rainbird Sprinkler Company of Glendora California, which had invented the horizontal impact sprinkler. This radical change in the sprinkler design was vastly superior to previous models because it applied the water more uniformly. Rainbird Sprinklers were sold with every Wade Rain system throughout the Northwest. Wade Newbegin first visited Rainbird when the owners,Clem and Betty LaFetra, were making sprinklers in a barn behind their house. 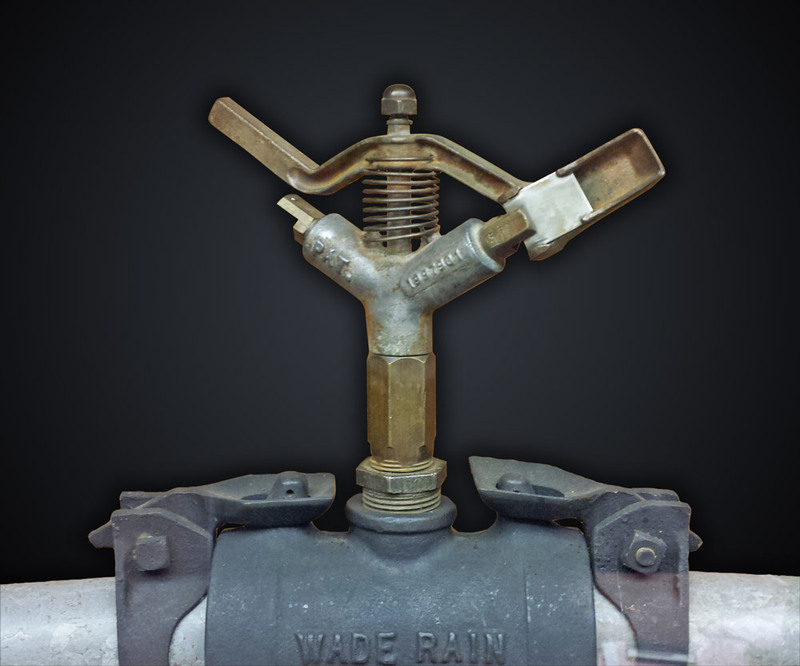 Wade Rain developed its knob and latch system coupler so it could latch both ends from the middle. This patented design was a big improvement and it became the identifying feature of the Wade Rain coupler along with the self-draining gasket.